Glasgow is a truly unique city, full of arts, culture and a vibrant night life. A wide range of hotels are available for every budget. Key Features: 5-Star, concierge, spa facilities, babysitting service, minibar and room service. 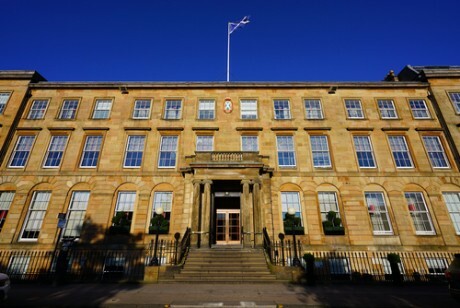 Described as a landmark hotel in the centre of Glasgow, Blythswood Square Hotel has just undergone a multi-million pound refurbishment. 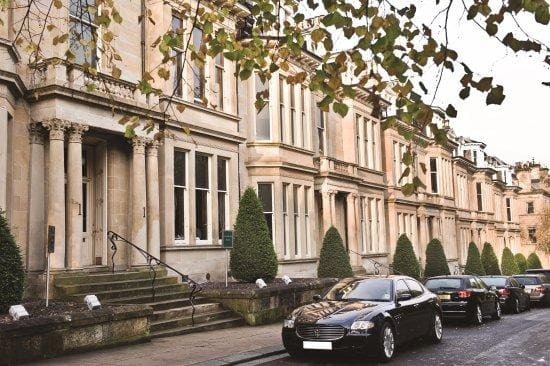 The only 5-star hotel in Glasgow, it is one of the most luxurious and well-appointed hotels in the city. The refurbishment included a fully upgraded spa reception area, 12 new bedrooms and a brand new 2-bedroom penthouse suite. It was voted winner of Scottish Hotel Awards hotel manager of the year 2017. It is a versatile hotel, with excellent facilities whether you’re looking for a romantic city break or a business trip. With its various well-appointed function rooms, it also makes a prime wedding venue. With a ground floor restaurant and first floor bar, the Georgian townhouse frontage overlooks its own private garden square. With its central location it is close to galleries, shops and theatres. Glasgow Central Station is a 7 minute taxi ride away. It boasts full luxury spa facilities with a heated indoor pool and hot tub, and a fitness centre with a well-equipped gym. There is also a babysitting service, full room service, and a concierge. Key Features: Central location, close to Central railway Station, heated pool and gym. Award-winning architecture. This modern and stylist hotel is convenient for Central Rail Station. In the heart of the West End, Glasgow’s cultural and bohemian epicentre with its cobbled streets, and nearby botanical gardens. Situated close to Kelvingrove Art Gallery, SSE Hydro and Riverside Museum, in the vibrant centre of Glasgow near to shops and cafes, it is an ideal base for exploring the city. The Radisson Blu boasts a fitness centre with heated indoor pool and gym, conference facilities with 15 meeting rooms, laundry and dry cleaning service, room service, and bathrobes, slippers and minibar in every room. There is also a concierge service. The restaurant describes itself a as classic British Brasserie with a twist, and there are two bars including a well-stocked cocktail bar. 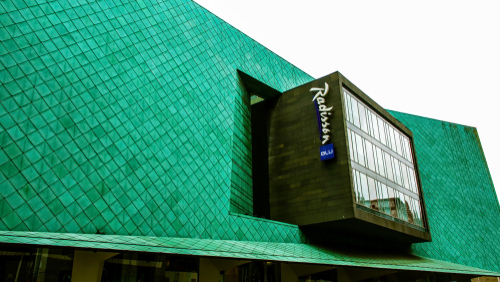 With award winning architecture and all the modern luxuries one expects of a 4-star hotel, the Radisson Blu is perfect for a romantic weekend or city shopping spree as well as a business trip. Key Features: 30 minutes from Loch Lomond, 24-hour room service, same day laundry service, free wifi. A luxury boutique hotel set in a tree-lined residential street in the fashionable West End, this hotel oozes old-school charm. Perfect for a romantic holiday, this Victorian building is relatively small with 49 bedrooms, but it also boasts the added comfort of ‘extremely comfy’ handsprung mattresses, Egyptian linen and deep roll-top baths. Calling itself a stately hotel with bistro, the restaurant is also open to the public, as is their afternoon tea in the sumptuous public lounge, which has been recently refurbished. Rooms vary from Standard, with a queen-sized bed and monsoon shower in the bathroom, to their Conservatory Duplex Suite, with lower level bathroom, conservatory lounge area and private patio. But if that doesn’t light your pipe, try their Luxtown, with separate living and dining rooms, king sized bed and luxurious bathroom suite with free-standing roll-top bath. It doesn’t have lifts to the upper floors, so call direct if you have mobility problems and need accessible rooms on the ground floor. The staff will be happy to accommodate. Other luxuries include 24-hour room service, laundry facilities, free high-speed internet, and business centre. They allow pets. Key Features: Child friendly, vegetarian friendly, close to Central Station, breakfast buffet, city views. The Kitchen, a trendy restaurant in the hotel, serves international cuisine, with good vegetarian options, and the bar is open all day for lunches and snacks. There is also Il Barista, a Costa Coffee franchise, serving fresh organic coffees and pastries. So plenty of places to unwind after a busy day in the city. You can also grab an early breakfast from 6.30am until 10am. A public car park is accessible from the hotel (£7 for 24 hours), and the hotel offers dry cleaning and laundry services. 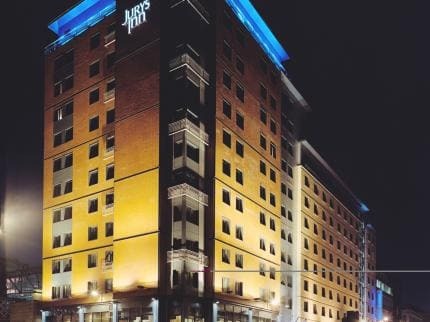 A favourite for couples visiting the city for shopping and nightlife, Jurys Inn boasts stylish bedrooms with full ensuite facilities. Other facilities include a business centre with internet access, meeting rooms, room service, air conditioning and multilingual staff. The hotel is featured for being child friendly by guests, and has the added bonus of being near the riverside – perfect for a stroll along the river. Key Features: Central location, famous landmark, champagne bar, grand staircase, adjoining rooms, concierge. 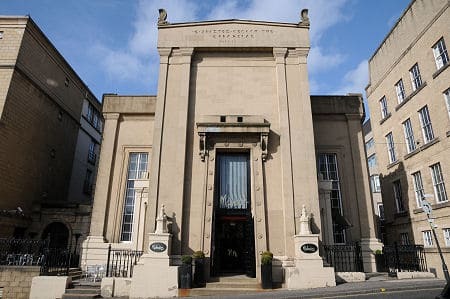 This 4 star landmark hotel next to Central Railway Station in the centre of Glasgow, is one of the top hotels in the city and has hosted stars like Frank Sinatra and Charlie Chaplin. John Logie Baird broadcast the first long distance TV pictures from a bedroom on the 4th floor in 1927. Built in 1883 and recently refurbished, the impressive entrance features the grand staircase, and a champagne central bar with domed ceiling, impressive chandelier and marble pillars. The wood panelled public spaces lend the décor a classic, turn of the century feel. A locally sourced contemporary menu can be found at the elegant Tempus restaurant, which features a minstrels’ gallery, and there is a buffet-style breakfast. With 21 meeting rooms and free wifi this hotel would suit business as well as pleasure. It is a great favourite with couples on a city break to catch up with shopping and nightlife. The central location could not be more convenient. Bedrooms are decorated in the classic style. Each bedroom has a laptop safe, iron and flat screen TV. Some of the bedrooms are adjoining. There is a concierge, room service and free wifi. Key Features: Architecturally unique, central location, family friendly, Michelin starred chef. Formerly a Greek Orthodox church, this extraordinary building has been tastefully converted into a modern boutique-style hotel, while still preserving some of the old church’s features. Located within easy reach of Sauchiehall Street, one of the most noted and historic streets in Glasgow, it’s a short walk to a host of other galleries, theatres, concert halls, and The Garage, Glasgow’s trendiest nightclub. Nearby is the ‘style mile’ shopping precinct of Buchanan Street and its surrounding lanes. If you want to mix business with pleasure. It is also right in the centre of the business district. A five minute taxi ride will get you to either of the city’s two main railway stations. Between the original church and the extended hotel is a glass roofed atrium which houses an American-style bar, and the pop art décor resembles a New York loft apartment. The award winning restaurant boasts a Michelin Starred Chef, and serves a mix of old and modern French cuisine. Other features include a choice of continental or cooked breakfast, room service, minibar in every room, and family rooms with reduced rates for 3 – 14 year olds. All bathrooms have built in power showers. Key Features: Grade B listed building, Central location, secure entry to lifts and staircases for guests, easy reach of main shopping and theatre district, children’s menus and gift packs for children. 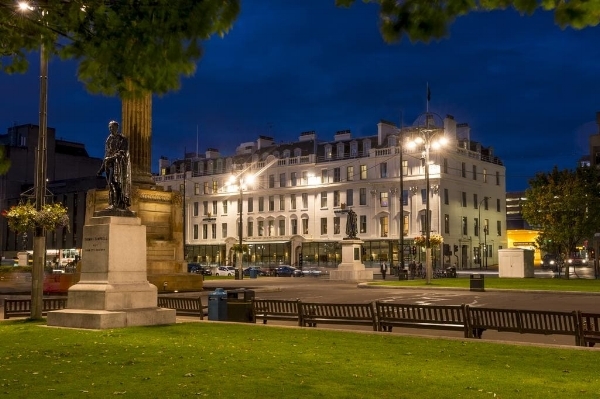 The Millenium Hotel is located on George Square, next to Glasgow Queen Street railway station, and within easy distance of Central station and tourist information points. This grade B listed hotel is an ideal location from which to explore the delights of the city, from shopping and museums to theatres and nightlife. The Royal Concert Hall is only a 5 minute walk away. An array of dining options are available including the brasserie restaurant serving Loch Fyne Seafood and Scottish beef. Other options include private dining and the Georgics bar, with a conservatory lounge overlooking George Square. A standard room offers free wifi, flat screen TV, safe, iron, full ensuite facilities trouser press and tumble dryer. At the executive end you can expect city views, bathrobes and slippers, soundproofing and some interconnecting rooms. You can find parking nearby for £11 a day. 5 conference suites with flip charts and LCD screens provide some business options, and travellers are impressed by the added safety of secure entry to lift and staircases by guests’ room key card only. Other features include 24-hour room service, laundry services and gift packs for children. Key Features: Central location overlooking Argyle Street, value for money, good choice of breakfast. 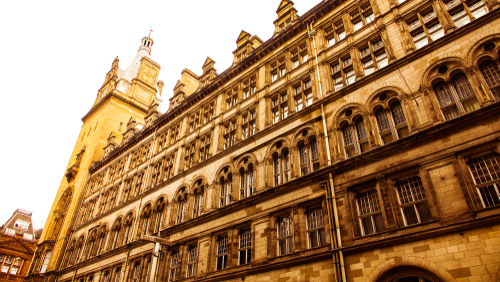 Situated in a central location on Glasgow’s famous Argyle Street, one of the main shopping thoroughfares in the city, this Victoria era building is in keeping with Glasgow’s architecture with its high ceilings adorning the public spaces and bedrooms. The hotel’s name is inspired by the Glasgow architect, Alexander Greek Thompson, who built many of Glasgow’s iconic structures. 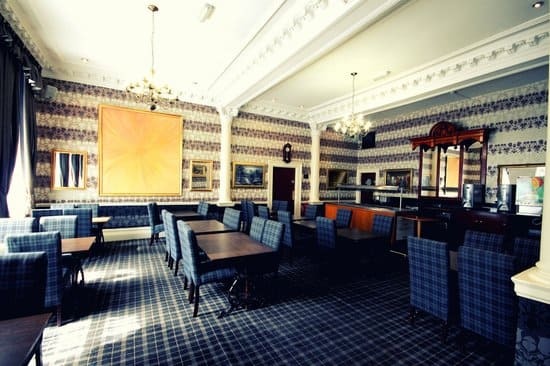 The reception area and public bar lounge are decorated in a classic style with dark wood panelling and chesterfield sofas, and from the reception a wide staircase sweeps upwards. There is also a lift to the upper floors. A well-stocked breakfast buffet with plenty of choice is included in the room price, but it finishes promptly at 10am so get there early. As a budget hotel it does not offer evening dining, but is within walking distance of a large array of restaurants and bars. There is parking in nearby Q car park, Jamaica Street, but ask about the special guest rating of £6 for 24 hours. The hotel boasts high speed internet wifi in all 125 bedrooms, and it has just completed a major refurbishment. Key Features: Free parking, affordable, value for money. Quiet rooms for location, close to SSE Hydro and local restaurants. 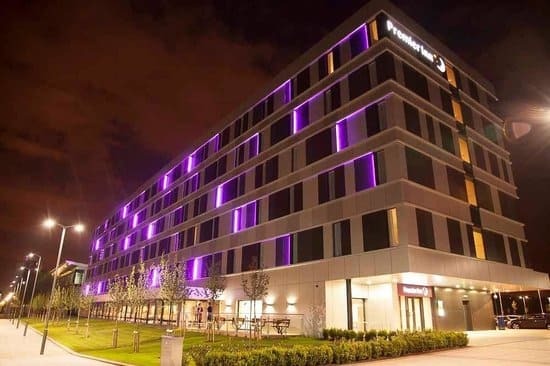 Situated on Springfield quay, within walking distance of the SSE Hydro and close to amenities, the Ibis Budget offers free indoor and outdoor parking, plus free wifi in all of its 165 bedrooms. Each bedroom with ensuite has a flat screen TV featuring 130 freeview channels. The rooms have a clean modern feel. A basic breakfast is not included in room rate, but is a cheap addition at £4.95. There is also a self-service café called ‘Fraiche’, with a seating area on the 6th floor, which offers hot and cold drinks, some alcoholic drinks and a range of sandwiches and snacks. This is in lieu of any tea and coffee facilities in the rooms; however, hot drinks are freely available here and can be taken back to the rooms if desired. There are many restaurants nearby, and some offer discounts for Ibis guests. The hotel is also a short walk from a 12-screen Odeon Cinema, Alea Casino, and a ten-pin bowling alley. It’s also a reasonably short walk into Glasgow city centre. Some rooms have wheelchair access, all have air conditioning throughout. Reception is on the 6th floor, and the helpful staff are multilingual. Key Features: Superb views over the river Clyde, very close to SECC and Hydro. Easy bus links and subway to city centre. A short walk from this value for money hotel will get you to the Hydro and the SECC (Scottish Exhibition and Conference Centre), so its location is excellent for big events. Close by is the Riverside Museum, with The Tall Ship, a fully restored Victorian sailing ship moored alongside. Many rooms overlook the Clyde, and are fully ensuite. Breakfast is a continental-style buffet with the usual array of choices, and the Thyme restaurant offers a wide variety of meals. If budget hotel food is not to your taste, there are many other choices around the SECC, with its cafes and restaurants. The city centre is less than 3 miles away, and there are regular bus links, with the bus stop just a 2 minute walk from the hotel and Kinning Park subway station a little further. The friendly staff are happy to help with directions. All the rooms have tea and coffee making facilities, a desk and chair, a choice of firm or soft pillows, blackout curtains, and most rooms have a king sized bed as standard. The flat screen TV features 80 freeview channels. On-site parking is available at £4 for 24 hours, and there is high speed internet with free wifi.